You’ve likely heard the advice to make sure you include a “safety” school in your college list. However, what exactly does that mean? 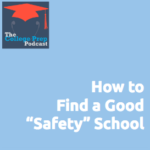 Click to listen in as Gretchen and Megan discuss safety schools! There’s a new book about habits that’s all the rage right now: Atomic Habits by James Clear. 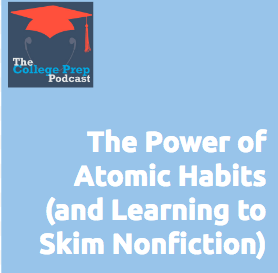 Click here to listen in as Megan discusses tricks about developing stronger habits! 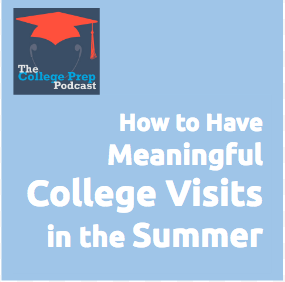 Just because it’s summer and students aren’t on campus doesn’t mean that you can’t have a rich, meaningful college visit. In fact, summer is one of the most practical times for families to visit colleges around the country, as a part of their summer vacations. So, how do you make sure that you glean as much information as possible when you’re walking around a campus that’s not humming with students? some examples from a recent summer visit Megan took to Texas Women’s University to help amplify her points.